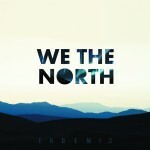 Something truly exceptional is finally happening in the global electro scene: We The North has arrived, a qualitatively superior project that represents one of the best synthpopish revelations of this year. Their refinement is discernable from the first listen, thanks to electronically geometric structures, so emotionally intense, played with extreme technical accuracy and attention for the melodies. This sensational debut “Endemic” ep is characterized by melancholic harmonies, enhanced by a superb vocal formulations and by artificial sounds that instantly conquer your listening, all created through precise drum programming and by catchy synth decorations. We The North can be defined with the word adjective “extraordinary”, while their release deserves all your broader consideration. Nothing else can be further added to this description: to fully understand the artistic greatness of We The North is fundamental to get into direct contact with their music. If you really want a new electronic experience that will leave you amazed, seek and find this astonishing eight-tracks release that includes also the spectacular remixes by TourdeForce, Mika Rossi, ES23 and I Parasite. Entertainment is absolutely guaranteed!